Just a little sneak peek of my idea board I did using all Ranger products for my upcoming event in September. As you know I am so used to doing candy colors or shabby chic because I love the colors and that's who buys my art. 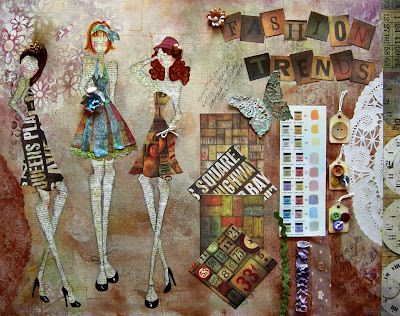 So this little project took me out of my little world and I loved creating what I call Industrial Chic Girls!﻿ The Tim Holtz paper I used was so much fun. It's like it was created just for me! Patterns in varied sizes, perfect for my dresses. I used the medium sizes for my 11x14 canvas and the teeny sizes for my tags. I loved using the browns and bronzes for my backgrounds. They contrast so nicely with my latest obsession - doilies! I will post the finished samples after the event. The Grunge Girl tags are adorable! Just a note...I finally updated my sidebar with classes and shows. I'm working on a few more. Look out east coast, Florida and local LA people! Gorgeous as usual. I wish I didn't live half way around the world from your classes. At least I have a copy of your book, that is wonderful. Do you ever do online classes??? Wonderful Julie!!! Love love love!! Hope you're having a great week. Well, I just love these,Julie! Great style! I love how you adept your style to Tims colors! Very cute, Julie! By the way, I just purchased your book online and can't wait for it to arrive. Keep up the great work! Oh Julie! I love this new look! Julie-grunge! AND, I'm so happy to see you calendar filling up!!! Absolutely Stunning - I have just received your book and I must admit to being totally hooked. I love these! I think your "girls" can work any color palette and style.